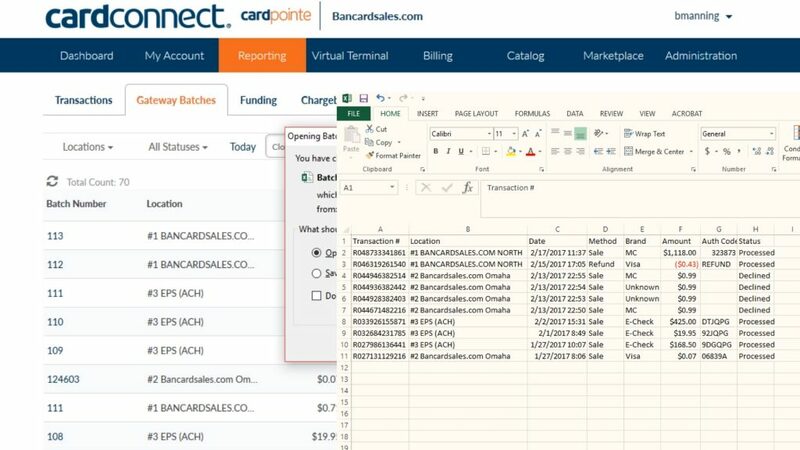 CardPointe is a processing and reporting platform and in this video I’m gonna cover the details of the REPORTING tab. Once you’re logged in, just click on the REPORTING TAB and the default TRANSACTIONS subtab will load. We’ll start with the transactions subtab. This is where you can customize the layout of the page to show the information that you would like to see. The search criteria includes: Location, Date, Method, Status, Front End, and Columns, in addition to the ability to save your searches. The COLUMNS tab gives you the ability to select the fields that you want your search columns to show. The options among many, include showing the last 4 digits of the credit card, name of the cardholder, transaction authorization code and even whether the transaction is part of a billing plan. You can see there are about 25 options showing here including any Custom user fields that you have added to your Virtual Terminal fields. If you haven’t added custom fields to the virtual terminal yet, click the link in the description to watch the video on customizing the CardPointe virtual terminal fields. Once you have selected the information that you want to see, you can begin your search AND you can always come back to this column in the middle of a search and update a column in real time. 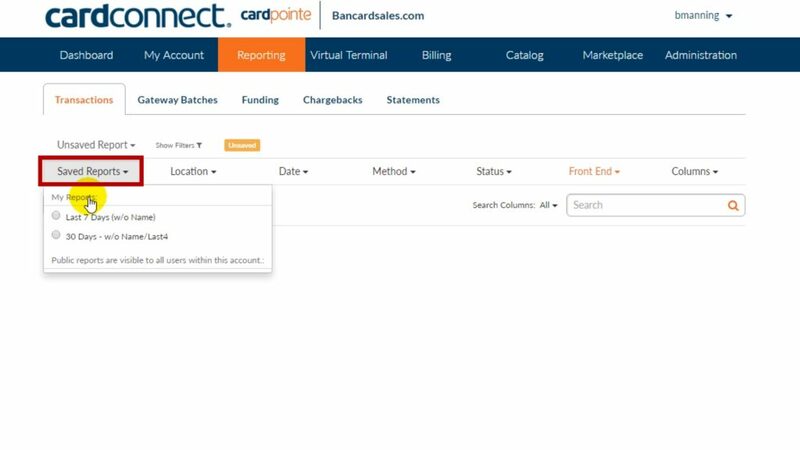 So in other words, if you have more than one store, or multiple businesses, you can link them within CardPointe and they can show up in your reporting tab. The DATE tab allows search, based a quick selection of Floating Dates OR a specific date range which you can toggle back and forth between. As you click, the report automatically loads the date search so if you click between 30 days and 90 days for example, the screen auto loads the transactions processed within those time frames. The METHOD tab allows search for transactions that fall under the classification of Sales, Refund, Force Credit, or Verify. 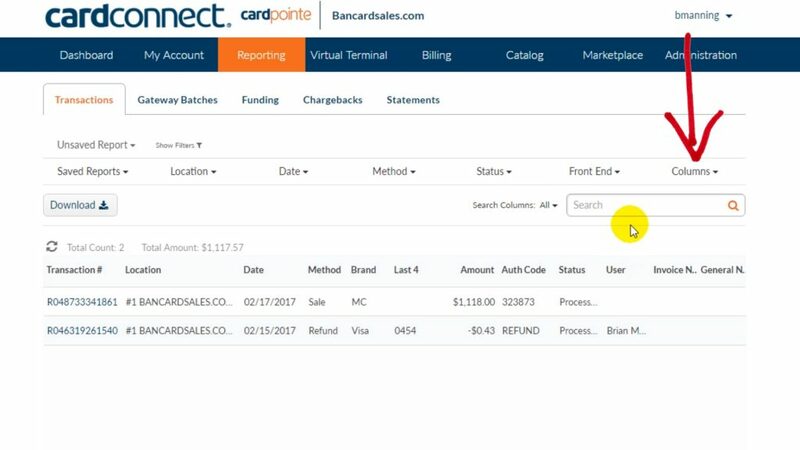 The STATUS tab gives you additional transaction status search fields including refunded, voided or declined transactions. **Keep in mind that at any point if your search is not returning any results and you feel like it should be or you cannot find a transaction that you’re certain took place, double check the other search criteria that you have selected such as the date range to make sure you’re including the parameters that will include your transactions in question. Because if you’re searching for transaction that happened 30 days ago and you have the LAST 7 Day box checked, it’s not gonna show that transaction. Remember this search updates in real time, so you can simply check or uncheck any option within a particular column. The FRONT END tab allows you to select the device or method that the transaction was processed through. So if you want to know all of the transactions that were processed through a CardPointe device or through the API for example, you can select the appropriate box and it will load the result. The SAVED REPORTS tab gives you the ability to simply save your favorite searches for quick reference. To create a new saved search start by clicking the NEW REPORT button and selecting the fields you want within your report. Then come back and click on the SAVE option and name your report and choose whether you want the report saved ONLY to YOUR user account, or for it to be made available to other users who are on this CardPointe account. The name of the saved search shows right here and if you ever need to recall what search criteria is within a saved search just click on the SHOW FILTERS link and it will toggle down to show the criteria that is being searched. The STATEMENTS TAB is an archive of the monthly statements that are sent to you showing all volume and charges for the month. You can search for and download statements as you see fit. You can search for and download statements as you see fit and if you want to download a specific statement just click on the statement Date which is a link and it will export to PDF. 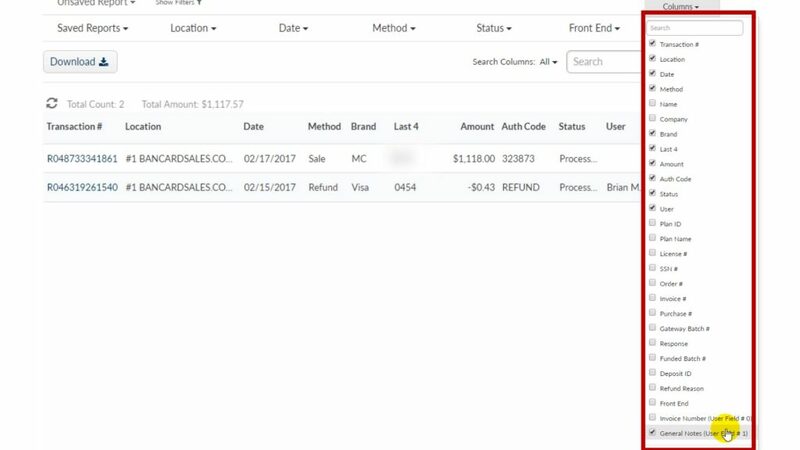 The CHARGEBACKS TAB is simply a place where chargeback disputes will be listed (per transaction) along with information and contact procedures to resolve disputes… all of this of course, if applicable. The FUNDING TAB is all closed and settled batch totals. If you click on the Funding Date, which is a link, it will open the details of that batch and you can see all transactions within that batch. It’s simply a running total of batch deposits. The Gateway Batches tab gives you a running total of batches sent and also gives you search box. One Final note about search is that you can download and export the data that you search so if you need to send it to a bookkeeper, or upload it to accounting software you can do it very easily. There is a DOWNLOAD button that’s listed on each of the REPORT menu subtabs and when you click on the download button it generates an excel spreadsheet that looks like this. The data shown of course will depend on the data that you have chosen to export with the search fields that we just discussed.